Bear Stearns was an investment bank that survived the Great Depression only to succumb to the Great Recession. Founded in 1923, it became one of the world's largest investment banks. In 2006, it produced $9 billion in revenue, earned $2 billion in profits, and employed over 13,000 employees worldwide. Its stock market capitalization was $20 billion in 2007. This well-respected firm offered a variety of successful financial services, except for one. Its greed drove it into the hedge fund business. That caused its demise in March 2008, kicking off the 2008 financial crisis. In April 2007, bond dealers told the managers of two Bear Stearns hedge funds that they should write down the value of their assets. The funds, High-Grade Structured-Credit Strategies Fund and Enhanced Leverage Fund, owned $20 billion in collateralized debt obligations. These derivatives were based on mortgage-backed securities. They started losing value in September 2006 when housing prices began falling. That was the beginning of the subprime mortgage crisis. In May 2007, the Enhanced Leverage Fund announced its assets had lost 6.75 percent. Two weeks later it revised that to an 18 percent loss. Investors began pulling out their money. Then the fund's bankers called in their loans. Parent company Bear Stearns scrambled to provide cash for the hedge fund, selling $3.6 billion in its assets. But Merrill Lynch wasn't reassured. It required the fund to give it the CDOs as collateral for its loan. Merrill announced it would sell $850 million worth that afternoon. But it could only unload $100 billion. Bear Stearns agreed to buy the securities from Merrill and other lenders for $3.2 billion. It bailed out the failed hedge fund to protect its reputation. In November 2007, the Wall Street Journal published an article criticizing Bear's CEO. It accused James Cayne of playing bridge and smoking pot instead of focusing on saving the company. 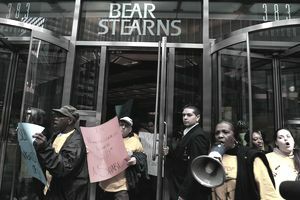 The article further damaged Bear Stearns’ reputation. On December 20, 2007, Bear Stearns announced its first loss in 80 years. It lost $854 million for the fourth quarter. It announced a $1.9 billion write-down of its subprime mortgage holdings. Moody's downgraded its debt from A1 to A2. Bear replaced CEO Cayne with Alan Schwartz. In January 2008, Moody's downgraded Bear's mortgage-backed securities to B or below. That was junk bond status. Now Bear was having trouble raising enough capital to stay afloat. On Monday, March 10, 2008, Schwartz thought he had resolved the hedge fund problem. He had worked with Bear's bankers to write down loans. Bear had $18 billion in cash reserves. On March 11, 2008, the Federal Reserve announced its Terms Securities Lending Facility. It gave banks like Bear a credit guarantee. But investors thought this was a veiled attempt to bail out Bear. The same day, Moody's downgraded Bear's MBS to B and C levels. The two events triggered an old-fashioned bank run on Bear Stearns. Its clients pulled out their deposits and investments. At 7:45 p.m. on March 13, Bear Stearns' only had $3.5 billion left in cash. How did that happen so quickly? Like many other Wall Street banks, Bear relied on short-term loans called repurchase agreements. It traded its securities to other banks for cash. The so-called repo agreement lasted anywhere from overnight to a few weeks. When the repo ended, the banks simply reversed the transaction. The lender earned a quick and easy 2-3 percent premium. Bear hemorrhaged cash when the other banks called in their repos and refused to lend more. No one wanted to get stuck with the Bear's junk securities. Bear didn't have enough cash to open for business the next morning. It asked its bank, JP Morgan Chase, for a $25 billion overnight loan. Chase CEO Jamie Dimon needed more time to research Bear's real value before making a commitment. He asked the New York Federal Reserve bank to guarantee the loan so Bear could open on Friday. Yet Bear's stock price plummeted when the markets opened the next day. That weekend, Chase realized Bear Stearns was worth only $236 million. That was just one-fifth the value of its headquarters building. To solve the problem, the Federal Reserve held its first emergency weekend meeting in 30 years.. The Fed lent up to $30 billion to Chase to purchase Bear. Chase could default on the loan if Bear did not have enough assets to pay it off. Without the Fed's intervention, the failure of Bear Stearns could have spread to other over-leveraged investment banks. These included Merrill Lynch, Lehman Brothers, and Citigroup. Bear's demise started a panic on Wall Street. Banks realized that no one knew where all the bad debt was buried within the portfolios of some of the most respected names in the business. This caused a banking liquidity crisis, in which banks became unwilling to lend to each other. Chase CEO Jamie Dimon regrets buying both Bear Stearns and another failed bank, Washington Mutual. Both cost Chase $13 billion in legal fees. Winding up Bear's failed trades cost Chase another $4 billion. Worst of all, says Dimon, is the loss of investor confidence as Chase took on Bear's sketchy assets. That depressed Chase's stock price for at least seven years. What Does the G-20 Do? What Did Barney Frank Do?